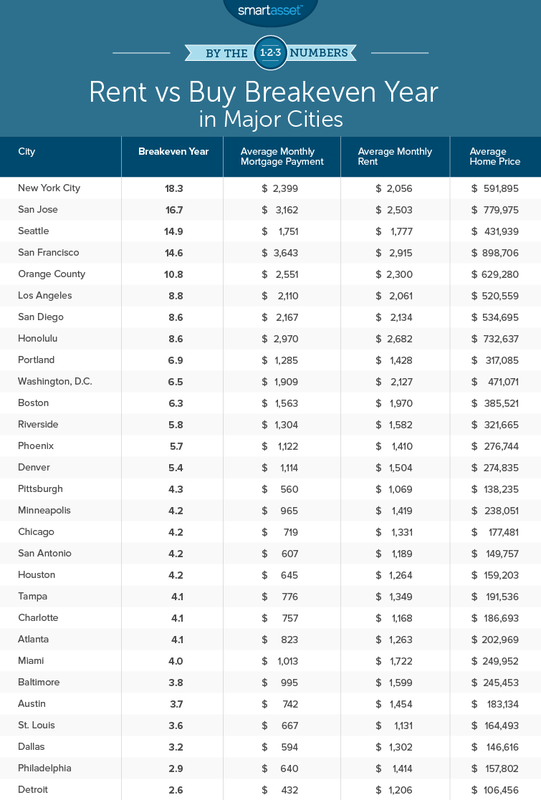 This helps us compare your monthly rental costs against your total monthly owning costs. What's the price of the home you are considering? This will be used to figure out the costs associated to your monthly home payments. What % of the Target Home Price do you want to put down? Down Payment will help us generate your monthly costs of owning a home. We use your marital status to determine the amount of taxes you will pay both while renting and owning. As there can be tax benefits to owning this helps us provide a more accurate answer. We need your income to figure out the federal, state and local taxes you will pay both while renting and owning. If you are married do not include your spouse's income. What is your spouse's annual income? Adding your spouse's income helps us determine your household income tax rate. Renting will always be better than Buying over the length of the loan. If you stay in this house for 12 year, Buying is better than Renting. If you stay in this house for 12 year, Renting is better than Buying. Our buy vs. rent tool builds one model calculating all of the relevant costs of owning and a different model including all of the costs of renting. Next we figure out the tax consequences of buying a home (we calculate taxes at the federal, state and local level) and consider how home value appreciation and mortgage payments impact your equity in the property. Once the models have calculated all of the costs of owning and renting we compare the two in order to show you how long you need to stay in a property for buying to make more sense than renting. First we start with the upfront expenses. Depending on where you want to move and the mortgage type, we estimate all of the relevant expenses required to close on a home purchase. This includes your down payment, local taxes, title insurance, mortgage fees and other expenses down to the appraiser's fee for assessing the value of your home. We then look at the annual costs, which include your mortgage payment, real estate taxes, homeowners insurance, maintenance expenses and, if relevant, mortgage insurance and HOA fees. It is important to note that our models use actual mortgage data from our partners, so the mortgage payments, amortization and any other related fees are all based on real mortgages that you could use to buy a property of the stated value. Finally, we calculate how much money you would have left over after selling your property. We account for any capital gains tax, realtor fees and other transaction taxes and expenses that you would have to pay when selling your property. 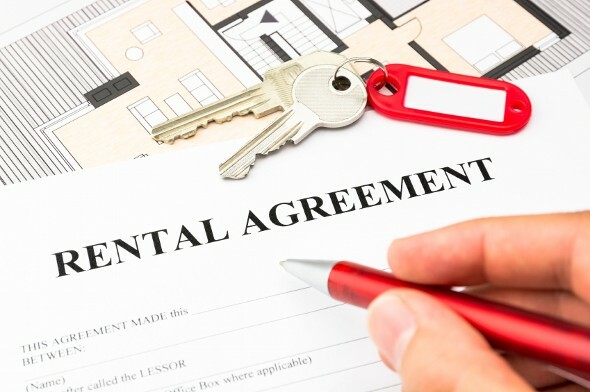 Calculating rental expenses is more straightforward. We take the initial rent amount you entered and then use the inflation rate, which you can also adjust, to calculate rental payments in the future. You can also add rental insurance or other expenses at your discretion. Mortgage data: We use live mortgage data when calculating your home affordability. Closing costs: We have built local datasets so we can calculate what closing costs will be in your neighborhood. Selling expenses: Our data partnerships allow us to accurately estimate the costs incurred during a home sale. Taxes: We calculate taxes on a federal, state and local level. The implications of real estate taxes, mortgage interest, mortgage points, mortgage insurance and other factors (including if you do or do not pay the Alternative Minimum Tax) are all considered in our models. To better align with filing season, tax calculations are based on the tax filing calendar, therefore calculations prior to April are based on the previous years tax rules. Home maintenance expenses: We calculate maintenance fees based on an “Annual Maintenance Fee” (which is a % of the home value) and “Monthly Additional Expenses” (which are fixed expenses that grow with inflation). 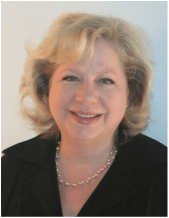 HOA fees: We assume that HOA fees are a fixed expense and that they grow with inflation. Breakdown: Does renting beat buying in America's big cities? Of course, renters don’t have to pay property taxes, homeowners insurance or maintenance costs. Those costs can really add up. In some areas of the country, like New Jersey and Westchester County, New York, property taxes are so high they cost the same as at least one or two extra mortgage payments per year. So if renting is better in the short-term and buying is better in the long-run, when does the financial logic switch? When, in other words, do the long-run costs of renting begin to outweigh the upfront costs of buying? This is known as the breakeven year. It could be three years, or seven or 15. The timing depends largely on where you live. That’s why our rent vs. buy calculator is location-based. Of course, while analyses like the above assume you are making your decision for purely economic reasons, there are other, non-financial factors you may want to consider as well. Many renters, for example, enjoy the flexibility of being able to change apartments and neighborhoods at the end of their lease. If you no longer like the area you live in or have to move for a job, renting makes life much simpler. Completing this can take months and really add up. Sometimes you don’t have the luxury of waiting until your house sells to move, which is another headache you avoid as a renter. On the other hand, buying a home gives you year-to-year continuity. In some areas of the U.S., rent prices can change drastically over the course of just a few years. What may have fit your budget a year ago might not now if your landlord hikes the rent when it’s time to renew. As a homeowner, you won’t face any spikes in your payment (adjustable-rate mortgages are one exception). But then we come to the question of maintenance. Fixing leaky pipes, painting, cleaning gutters — these are all costs of owning a home. As a renter, most of those issues are the responsibility of maintenance personnel or your landlord. That said, many renters complain of unresponsive landlords who refuse to deal with things like bad plumbing or a faulty fridge. These are matters of personal preference — do you like fixing your home or do you prefer others to take care of it? It’ll come down to your personal preferences as well as what your current and projected housing needs dictate. For a long time, the common wisdom was that buying a home was a far better financial choice than renting one. As home prices across much of the country marched upward during the 20th century, a house was considered the safest investment around. The logic was simple: if you were spending 30% of your income on housing, you might as well spend that hard-earned cash on something that would retain its value for you in the future. Renting, by contrast, was wasteful. The rent vs. buy decision traditionally was a straightforward one. That all changed in 2007 when the housing bubble popped. A house, it turned out, could lose value — and, as some real-life cases demonstrated, could do so in spectacular fashion. There were stories of totally abandoned neighborhoods outside of Las Vegas and half-constructed mansions in Florida. Those with the misfortune to buy at the peak of the market in 2006 lost thousands or even millions of dollars overnight. Mortgages went underwater and foreclosures skyrocketed. The housing bubble led to a financial crisis that affected not only home values, but also jobs and the economy at large. If you were a renter during this time, you probably had it easier. Rather than dealing with a fatal blow to your home’s value, or even foreclosure, you had the flexibility to downsize apartments if you needed to tighten your budget or even move to somewhere with a more affordable cost of living. Today, there is no clear answer to the rent vs. buy question. In some cities, and for some individuals, buying a home may make more sense, while for others, renting a home may be the better choice. This makes it even more important to run the numbers and see what is best for you and your family. In the end, the rent vs. buy decision comes down to your preferences, plans and personal finances. If you know exactly how long you want to stay in your home and where you want to live, and you have some money saved up, the decision could be as easy as calculating which option will cost you less. If your future is less clear, however, you may have more to consider. Methodology Where is the country’s strongest buyer’s market? To answer that question, SmartAsset gathered data on average rents and home prices, and compared buying to renting in every county in America. Specifically, we compared the total costs of buying and renting a typical home or rental in each county, for a household earning $100,000 a year. For the “buy” scenario, we made the following assumptions: a mortgage rate of 4.5%, closing costs of $2,000 and a down payment of 20%. For each county, we calculated the breakeven point in the buy vs. rent decision— the point at which the total costs of renting become greater than the total costs of buying. The counties with the shortest time to break even are the best places to buy. Interactive: Should you rent or buy? Housing markets in major cities are often far more competitive than those in small towns or rural areas. That affects the rent vs. buy decision, as potential homebuyers in metros frequently face significantly higher prices, fees and closing costs. Those high upfront costs can mean that it only makes sense to buy for homeowners who are willing to stay put for a longer timeframe. Developments like the boom in tech jobs and increased migration to sunny West Coast cities have shifted housing economics towards renting in some parts of the country, while in other areas, like the South and Texas, buying is still usually the better bet. The Big Apple’s housing market is notoriously competitive, and indeed, SmartAsset’s research shows it is the worst urban market for homebuyers in the country. Good deals are nearly impossible to come by and when an attractive option appears on the market, it is often snapped up in days if not hours. That competition bids up prices, which means homes are comparatively more expensive than rentals. The typical New Yorker would need to stay in her home more than 18 years to justify buying instead of renting. The boom in high technology over the past few years has generally been concentrated in a relatively small number of cities. It has been especially pronounced in the Bay Area and in Seattle. The growth in high-paying tech jobs in these cities has had profound consequences on their homebuying markets. In these three cities buying a home only makes financial sense for those who can stay put for at least 14 years (on average). Take note, however, of rising rents. If rents in these cities continue to increase over the next few years, buying may become a more sensible medium-term option for those who have the cash to cover closing costs and a down-payment. In these four western cities, the weather is great, populations are growing quickly, and renting usually beats buying. Average home prices in these cities aren’t quite as high as in the tech hubs or New York, but they are still outside the range most residents would consider affordable. On average, homebuyers in these cities recuperate the costs of buying (instead of renting) after 8 to 11 years. As usual, this Oregon city defies categorization. It hasn’t experienced the boom in tech jobs of its neighbors to the north (Seattle) and south (San Francisco), and the weather in Portland isn’t the draw that is in other Western cities. Yet, the average home in Multnomah County costs over $315,000 (50% more than the U.S. average) and population growth has been steady. Those factors place Portland in a middle ground between buying and renting: for the average Portlander, buying makes sense if she plans on staying put for seven years or more. D.C. and Boston have historically been among the most expensive housing markets in the country. In these cities, high up-front costs tilt the economic logic away from homebuying for residents who may plan to move around in the near future (recent graduates, for example). But residents who are settling down for the long-term (like more than 6.5 years) could be better off buying. These three western cities are experiencing strong population growth, which has put some upward pressure on home prices. In these cities, residents who are comfortable staying in one place for the medium- or long-term should at least consider buying. On average, they will recuperate the high up-front costs of purchasing (instead of renting) in five to six years. Especially compared to the west and the northeast, buying and renting in the Midwest are both relatively affordable—but because homeownership also increases a person’s net worth over time, buying often makes more sense in the medium- and long-term. The average homebuyer in one of these Midwestern cities should recuperate the upfront costs of closing on a home in just over four years. Traditionally the most affordable parts of the country (for homebuyers), Texas and the south lived up to their reputation in our analysis. In every major southern or Texan city we examined, the average resident would recuperate the up-front costs of homebuying within just four and a half years of closing. After that, the savings would begin to accumulate. These two cities buck all the trends. Both have seen their populations fall in absolute terms in the past 50 years (Philly’s by 25% and Detroit’s by 50%). The result is a housing supply far larger than demand, and, in turn, bargain basement prices. 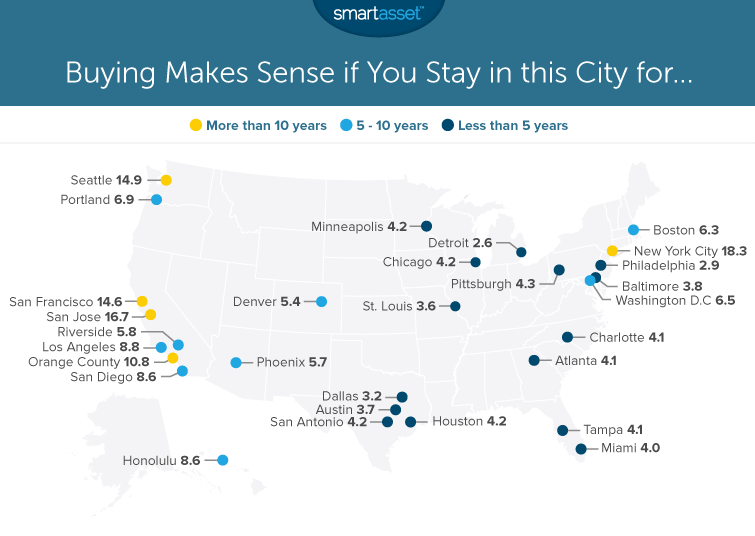 On average, a resident of either of these cities should only stay in a rental if she might be moving in the next 3 years.